C’est Bon Anthology is the Swedish based international comics anthology that will always be by your side when you dive into that experimental ocean of comics in which we float. This issue is themed »Interposed«. Because we want to know what happens when something or someone is placed, not in this defined space here, nor in this defined space here, but rather in that unspecific inbetween. Authors: Allan Haverholm [DK], Anna Degnbol [DK], Christoffer Frostgård [SE], Derik Badman [US], EME [ES], Evgeny Yakolev [KZ], Leif Engström [SE], Mikaela Elf [SE], Milena Simeonova [BG], Oliver East [UK], RM Rhodes [US], Tym Godek [US] ISBN: 978-91-979570-3-8. This issue is themed »Interposed«. Because we want to know what happens when something or someone is placed, not in this defined space here, nor in this defined space here, but rather in that unspecific inbetween. 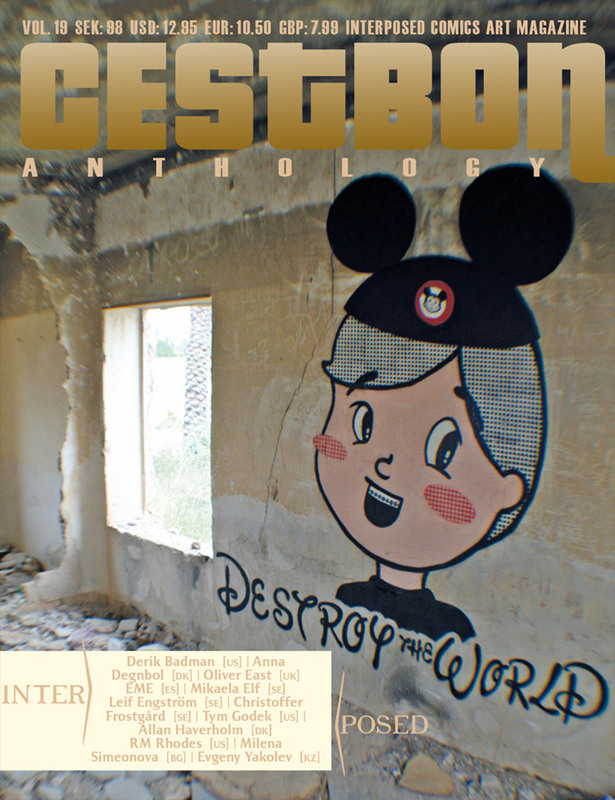 And also because this issue is released to accompany the C’est Bon Kultur exhibition in><between that first and foremost deals with inbetween panels. But we knew there was more to this. Interposed, inbetween panels, the actual story stands tall and proud and says hi. Inbetween the superfluous lies pure essence.